The world of adulthood is, ideally, a world of logic and reason. We exchange pleasantries. We exhibit genuine interest in how another person’s weekend went. We refrain from being the A-hole who eats three donuts off the box meant for everybody. Conflict is resolved promptly with direct and honest communication. Unfortunately, the modern office isn’t always an arena for favorable behavior—and sometimes, it’s our own bosses giving us the short end of the stick. We count on our superiors for professional growth and counsel, but when all you’re getting is the occasional side-eye and the more than occasional backhanded comment, how exactly do you deal without causing too much of a fuss? Respond to backhanded comments with politeness. When your boss makes an slightly hurtful quip about your brief stuttery moment at last week's meeting, resist the urge to play along or respond coldly. Passing it off as fun office banter will only encourage them to continue the behavior (and show them that you don't mind), while responding with hostility will, womp womp, also encourage them to continue the behavior (they've succeeded at provoking you, and best believe they're not stopping now). Even when politeness is not deserved, keep a level head: say your response then move on to something more pertinent, or excuse yourself. This signals to your boss that you mean business and will not stick around for comments that aren't constructive. Take stock of all instances that have made you feel provoked or uncomfortable. Again, should HR or your boss's immediate supervisor have to be informed about all this, it's best to have a detailed account of tense or difficult experiences you've had with your boss. No matter how minor, document each instance along with the date and the work project it was related to. If you feel silly about making a list, then designate a friend who hears the bulk of your work rants (it could even be a trusted coworker) and talk about the instances online, where you can keep easy track if necessary. Think about interactions in advance. So your boss is giving you a hard time. Doesn't mean to get to throw in your towel and screw being mindful of your behavior around them. In this unfortunate corporate structure, your boss is still your boss, and they ultimately have more power than you (and can more easily curry favor with the higher-ups, if the politics at your office are particularly unsavory). It’s not fair that you have to make accommodations for the person who’s supposed to be looking out for you, but until you can take more concrete steps to fix the issue, all you can do is brace yourself for the moments their passive-aggression is likely to arise. Once you successfully anticipate those annoying facial expressions, vague responses, or tense body language, encounters with your boss won’t give you as much anxiety as they used to. You’ll be better equipped to handle interactions with them if they don't catch you off guard anymore. Don't try to get people on your side. Aside from the friend group you trust, don't try to sneakily rally people in an effort to undermine your boss. While your grievances are valid, talking ill of them behind their back makes you look just as bad as your boss. If you're truly in the right, the office will know without you having to tell them. Also, once you venture out of your trusted circle, there’s no telling the extent to which your words will spread. The soft-spoken girl two rows from you who doesn’t look like she cares about office gossip? She was dormmates with your boss in college and is passing on every word to them now. There goes your upper hand. If all else fails, prepare to confront your boss directly. The behavior has manifested more than just a few times. Your coworkers have noticed that your boss is singling you out. Your job performance has been directly affected as a result of her actions. Your boss has begun to comment negatively on things that have nothing to do with your job (e.g.., your appearance, your personal life). You dread having to enter certain areas of the office, knowing that you’ll run into them. You are considering quitting your job because of them, even if you have no issues with the job itself. By directing the focus towards your professional growth, you allow your boss to reflect on their behavior without casting an accusing finger in their direction. If, after this approach, your boss continues to be difficult, then escalating matters with your boss’s boss and/or HR is at your sole discretion. You’ll have to consider, though, that this is a decisive step—and if your boss has been intentionally indirect, then this act of directness may cause her to become more uncooperative. In situations that involve potentially jeopardizing your source of income, you always want to err on the side of caution. 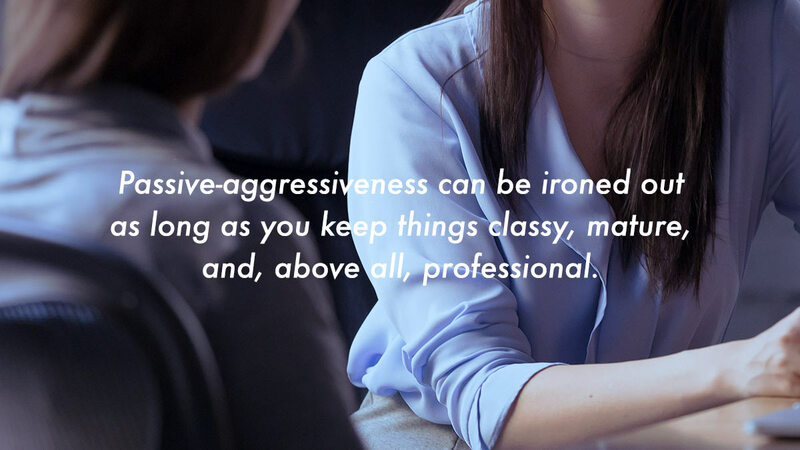 Having to deal with a boss who can’t (or won’t) confront you directly is definitely more than what should be asked of you as an employee, but passive-aggressiveness can be ironed out as long as you keep things classy, mature, and, above all, professional.